When the original series of “Heroes” ended five years ago with Claire Bennett (Hayden Panettiere) revealing her powers, and therefore the existence of “evolved humans” (or “evo’s”, as they’re now called), it left some pretty big questions unanswered: how would society react? What would be the repercussions of Claire’s reveal? Could evo’s and non-evolved humans exist together in harmony? In the first few minutes of “Heroes Reborn”, it looks like the answer is “yes”. It is June 13th, 2014—thousands are gathered in Odessa, Texas for a summit held by Primatech Paper Company to promote a peace and acceptance between those with powers and those without. It is a beautiful vision of what could’ve been, in a perfect world. Unfortunately, we’re reminded very quickly that we do not live in a perfect world. Both the summit and the hope for peace and acceptance come to a fiery end when a huge explosion destroys Primatech and the lives of many of the summit attendees. We are told that it’s a terrorist attack by evo-extremists, led by none other than Mohinder Suresh (Sendhil Ramamurthy, from the original series). And just like that, the course of history changes. Over the next year, evo’s are hunted down, captured, or flat-out executed by either the government or vigilantes desperate for revenge. They are forced to flee or go into hiding to save themselves. For evo’s and their families, the world is a dark and dangerous place. Our story begins a year to the day after the Odessa attacks. The evo’s are still on the run, still in hiding. Somewhere in Chicago, a group of evo’s gathers in a church for a secret support meeting. Among them is Tommy, a teenage boy that has been on the run with his mother, trying desperately to keep his powers hidden while he yearns for a “normal” life. The group airs their fears and frustrations, conspiracy theories and ideas, but one man stays silent, listening. When he finally speaks up, he tells the group of his son, who died in his arms after the explosion at Odessa. He believes that evo’s need to be stopped, at all costs. The man’s name is Luke Collins. Another evo bursts in, announcing that they’ve been found. A woman enters just behind him and shoots and kills him. She is Luke’s wife, Joanne. Luke stands up and starts shooting as well. They kill everyone in the room and set fire to it before they depart. And thus, “Heroes” is reborn. Having survived Luke and Joanne’s massacre thanks to a well-timed text from his mom that made him leave the meeting early, Tommy (Robbie Kay) is trying to maintain a “normal” persona at a high school in Illinois. He is attracted to a friendly girl named Emily (Gatlin Green), much to the annoyance of her boyfriend, Brad (Jake Manley). Emily convinces Tommy to take a job at the ice cream shop she works at, Moe’s. However, on his first day, Tommy reveals his powers to Emily by zapping Luke and Joanne away before they could shoot her (or kidnap him, for that matter), since she ran after them after they left the shop. Emily is amazed by Tommy’s powers and promises to keep his secret. She wonders where Luke and Joanne went after they disappeared, and Tommy tells her that he doesn’t know where anything ever disappears to when he uses his power. However, Tommy isn’t really the most careful of evo’s– hidden away (or so they think) in a garden shed at school, he makes a flower disappear for Emily, and her jealous boyfriend sees. Brad tells Tommy that he’ll keep his secret if he makes his abusive stepdad disappear. He’s unable to do it, however, and thus is understandably confused when Brad thanks him for taking care of his stepdad and also promises to keep his secret. Meanwhile, a mysterious man (Pruitt Taylor Vince) with a briefcase full of pennies seems to be following Tommy and helping him stay hidden. He was able to erase the memory of a delivery man who went to the cops after seeing Tommy fleeing the church just before it burnt down. And when Tommy fled Brad’s house, unable to make his stepdad disappear, the mysterious man seemed to take care of it. But is he there to protect Tommy, or are his motives more sinister? 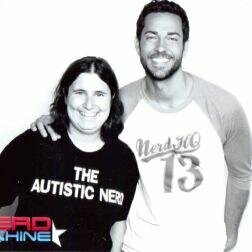 Luke (Zachary Levi) and his wife Joanne (Judi Shekoni) were once a happy family with their son, Dennis. But they lost Dennis in the Odessa attack, and since then have embarked on a murderous, vigilante rampage against the evo’s to avenge their son’s death. While Joanne seems to thrive on the violence and danger of their mission, Luke just seems resigned. After their killing spree at the church, the two have stayed in the area to track down Tommy via the “frequent customer” card he accidentally dropped at the meeting for an ice cream shop called “Moe’s”. Luke thinks they should leave for Los Angeles instead and track down the “El Vengador”, an evo vigilante they’ve been hearing about, but Joanne is determined to “finish the job” and kill Tommy. But when they confront Tommy, he uses his powers to teleport them to a random child’s playroom. Luke and Joanne argue about their lives and their marriage as they try to figure a way out of the room– or, at least Luke does. When he realizes that there’s no light switches in the room they’re in, he shoots out the lights. They’re in an observation room. They break the observation window (disguised as a chalk board) and escape… into the underground levels of Primatech. When they happen upon a room full of employees working at computers, Joanne doesn’t bother to ask questions, but starts shooting. Luke joins her and they kill all of the Primatech employees. They make their way out of the ruins and escape, stealing a car parked outside (and shooting the man that was inside of it). Joanne can’t believe their luck- inside the car seems to be information on the whereabouts of every evo known in existence. They can find and kill every one- but Luke doesn’t seem all too thrilled about this turn of events. Carlos, a military hero, is living what seems to be a fairly meaningless existence. He is back from duty and giving inspirational speeches to elementary school students. One happens to include his nephew, Jose, who clearly adores his uncle. Jose also adores El Vengador, the evo-vigilante that has been protecting East LA. But Carlos doesn’t see himself as a hero, and neither does his brother, Oscar (Jose’s father), who feels like Carlos abandoned his family. The two have an extremely strained relationship, and argue when Carlos goes to visit his brother’s car repair shop. Later that night, Carlos returns to the repair ship to talk to his brother, only to find him in a secret room underneath the shop. He is wounded and bleeding, and as Carlos looks around, he realizes that his brother is El Vengador, and an evo. Oscar had been double-crossed; he was led to an alley where he thought he was going to save a girl’s life, but the girl turned on him and shot him. Oscar believes that there is a corrupt sanction of the LAPD that is capturing and selling evo’s. As he dies, he asks Carlos to continue his mission to stop them. While Carlos tries his best to comfort a grieving Jose, the boy wants to be left alone. It turns that he, too, is an evo, and is able to pass through solid objects. The priest at Oscar’s funeral approaches Carlos and tries to convince him to take up his brother’s cause. After some research, Carlos finds that his brother was right- his murder was set-up by a corrupt cop. He also finds out that not only is the local priest an evo (with some seriously creepy smoke-person powers), but he was helping Oscar with a sort-of underground railroad for evo’s to help them get to safety (in Canada, because Canadians are nice, eh). Carlos wants revenge for his brother’s murder, and he helps an evo and her child get to safety through the underground railroad. He may not see himself as a hero, but it looks like he’s about to become one. Noah Bennett (Jack Coleman), also known as HRG, is also in hiding, though not due to any evolved abilities— he is a former employee of Primatech and the father of Claire Bennett, who died in the explosion in Odessa (or DID she?). He is living a new life as Ted Barnes, a car salesman. He is engaged, and seemingly happy. But he’s also being followed—by (Henry Zebrowski), a conspiracy-theorist who used to work for a company called “Renautas”. Quentin claims that Renautas took over Primatech, and that they’re still taking part in the capture and execution of evo’s. He also thinks that Renautas is behind the Odessa incident. He thinks something bigger is going on, that Mohinder is just a “patsy” and that the increasing number of evo’s means one thing: they’re here to save us. HRG just wants to be left alone, still in mourning for Claire and the soured relationship between them (due to her “coming out”) that he hadn’t been able to fix, but Quentin wants HRG’s knowledge and help to expose Renautas (and find out what happened to his sister, but you should’ve known that from “Dark Matters”!). HRG bails Quentin out of jail and they head off to Odessa to see if they can recover any old files. When they get to the site, they find remnants of the destruction and lots of warning signs about “toxins”, but HRG sees through the disguise and quickly finds a way into the underground levels of Primatech, which seem to still be active. He finds the room full of employees, but unfortunately, Luke and Joanne have already been through there, and left only the dead or mortally wounded behind. However, he is able to get a few bits of information from a dying ex-coworker: they are launching a new technology that next day in Colorado, something called”Epic”. It works from Molly Walker’s powers. HRG realizes that he needs to find Molly Walker (Francesca Eastwood), an evo that is able to find any other evo in the world, before anyone else does. Little does he know, some Primatech employees have already gotten their hands on Molly in New York City when she tried to hustle them out of money. She was trying to disappear, but it looks like it might be too late. When Miko unsheathes the sword, she is transported into the “Evernow” video game… and turns into Katana Girl! She fights off the bad guys with ease, and seems to be on a mission to save her father. Ren returns to the apartment and sees Miko on the computer screen, fighting as Katana Girl. He helps her fight through the level to get to her father, but she is knocked unconscious at one point, and therefore returns back to reality. But when Miko awakens, she is determined to save her father, who had been taken to Yamagato Tower in the video game, but it’s also a real building in Tokyo! She re-enters the game and gets to the tower. As enemies surround her, she unsheaths her sword, only to find herself in the lobby of the real Yamagato Tower! She begins to fight, seemingly becoming Katana Girl in real life… but how did she get there? Meanwhile, in the Arctic Circle, a young girl reaches towards the sky. Colors appear and grow brighter, and a black hole appears. She looks worried. “I can’t control it much longer,” she tells us. Well, THAT can’t be good! I wanted that dinosaur toy from Tommy’s old observation room SO BADLY. It made such an awful yet wonderful noise. Sell that dinosaur as merchandise, NBC. Coach Lewis is the coachiest coach that ever did coach. Am I right? If you saw him randomly on the street, you’d IMMEDIATELY know he was a coach. Like, I was expecting his power to be blowing a whistle without having an actual whistle or something. Oh, Tommy. You make bad decisions. Like, in a world where everyone is scared of evo’s, no one FREAKED THE EFF OUT when he held out his hand at Brad when he shoved him into the lockers? COME ON. I would be running down the hallway if I saw that. For someone who’s had to run so much, you’d think he’d be a bit more careful. TEENAGERS. I really love Luke’s facial expressions. Like, you can read Luke’s hesitation and lack of passion in his and Joanne’s “mission” JUST from the facial expressions. ACTING! Also, Luke sounds a lot like me when I first wake up in the morning. That “old, creaky door” voice. The ribbon in Miko’s hair bothers me. Like it is really serving no purpose, shouldn’t she be using it to tie back her hair more so she doesn’t accidentally cut it off? Remember to catch “Heroes Reborn” on Thursday nights on NBC! What were your thoughts about the premiere episode? Tell us your theories in the comments below! This entry was posted in Heroes Reborn, Recap/Review, TV. Bookmark the permalink.